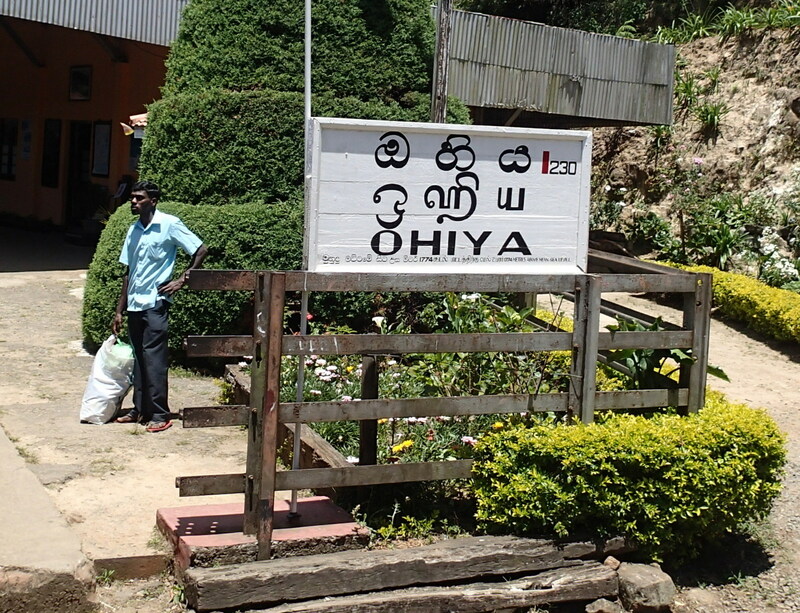 Is This The Chirpiest Town in Sri Lanka? Tomorrow is our last day of travelling. This brings mixed feelings: part of me could carry on this lifestyle forever; part of me pines for home comforts. The grass, as they say, is always greener. No more packing up our troubles in the old kit bag; no more roaming the hot, dusty streets in search of a big family room for a small family budget; no more wild animal adventures; no more 17 hour bus journeys; no more removing fear inducing insects from the bathroom; no more sleeping on top of each other. No more seeing my girls every single minute of every single hour of every single day. It is a very, very sad thought. As for the children, they are incredibly enthusiastic about returning home. They can’t wait to taste fresh, creamy milk again, and to see all their ‘dodo bears’ (soft toys). We’ve allowed them to input into our first UK supermarket shopping list, which is going to be delivered to our home just hours after we arrive (what luxury!) so it now contains all the ingredients to make trifle, a number of crisp based snacks and most of the dairy aisle. It also has our favorite Malbec wine, real ale, chedder cheese…all the things we’ve missed eating and drinking. After managing not to gain weight after a year of eating out, we are in danger of ballooning in our first week back! But ask them if they’ve enjoyed it? “SO much!” is the reply I got last night. I wonder if they can really remember what our old routine was like, or appreciate how much freedom they’ve had this year. For now though, we are all very excited about going home. For the first few days our house will seem like a mansion, the cold weather will seem refreshing, English food will seem delicious, and it will be amazing to see our friends and family again. We even have a new family member, a baby girl cousin to our girls. I am so excited about meeting her! The challenge is to carry on appreciating these things in the weeks and months to come. My bike (all of us)! It’s a pretty comprehensive list… I wonder how much we will really remember to appreciate once we are actually there? For now, we’ll try to concentrate on enjoying our last 24 hours of hot sandy beaches, warm sea, a swimming pool, a resident monitor lizard in the canal outside, friendly locals, eating unidentified food, and enjoying being together as a family. Blue whales: the largest creatures on earth, bigger even than the largest dinosaur specimens found to date. It’s got to be worth getting up at 4.30am, right? We’ve had some very mixed results when attempting to see wildlife on this trip. We must be the only people ever to have spent 41 days in Chitwan National Park and not seen a rhino. Most people stay 2 nights and manage to see a few. And the dugong watching trip was an exercise in patience, resulting in a 4 hour boat journey where we saw nothing but sea, and then 2 dolphins swimming in the sea right outside our guest house when we got back! However, this has to be balanced against the amazing pod of dozens of dolphins we were surrounded by in the Philippines; the awe inspiring close encounters with orangutans in Borneo; and the rather alarming abundance of komodo dragons in Komodo National Park. On balance, it had to be worth a try, and we selected a more expensive, (hopefully) ethically sound company who work to protect the whales, and (again hopefully) donate part of their profits towards this cause – Raja and the Whales. They guarantee you will see whales, by offering a free trip the following day if you don’t (and so on, until you do). But we were all hoping for just one 4.30 alarm clock, thanks very much. As it turns out, our luck was in. Just 30 minutes or so into the journey, we were called upstairs. The children kneeled on mats around the rail at the front, and I sat with them, while Fergus managed somehow to stand up on the swaying boat, camera poised and at the ready. “Wow!” said the crowd, and pointed! I saw nothing…where were they? Then a big “Oooh!” and everyone was pointing the same way and looking very impressed. But I could still see nothing! “Mummy, it just came right out of the water, I saw it’s fin!” shouted Evie. Damn – I’m going to totally miss this, I thought. Then, suddenly, right next to the boat and significantly nearer to than where I’d been looking, I saw it – a spout of water, a shadow, and then suddenly, the huge bulk of the gigantic creature, slowly and gracefully arching out of the water, spurting water as it looped back downwards into the depths. Wow. It was seriously amazing. The fun didn’t stop there. The crew were really knowledgeable, explaining that this one had dived deep now, would stay down for 7-8 mins and then come back up. The boat moved along to where they predicted it would be, and true to form it reappeared, this time with a friend. This pattern was repeated over and over, and we had countless opportunities to marvel at these creatures, and to take photos and vidoes. Pig tail time – too early! Once all the passengers agreed we’d seen enough, we made back to the mainland, and were served a very ambitious and bouncy breakfast of eggs on toast en route. It was very strange to find ourselves back by our normal breakfast time, having had such an amazing day out, and yet having a full day ahead of us. We took a walk through Mirissa harbour, where sadly, we were reminded that not all the businesses in Sri Lanka are interested in animal welfare by the presence of shark fins being brought in from the night fishing boats. How sad to see these majestic creatures slaughtered to the point of almost extinction for a status-symbol soup in China. As long as there is demand for the fins, who can blame the locals for making money from this? It’s a terribly sad situation. The rest of the day was spent splashing about in the waves on the exceptionally pretty Mirissa beach, sipping tea in other people’s posh resorts, and eating prawns & chips by the sea. It’s a hard life travelling (actually, it really can be sometimes), but some one’s got to do it! How good is this resort? Clearly, it’s not ours! Pool time delayed due to discovering just how much fun you can have with bouncy beds, balloons and ceiling fans. We’ve been building up to today for weeks. Months, even. We’ve booked into a posh (for us) resort in Tangalla, Southern Sri Lanka for three days of swimming pools, huge buffet meals, comfy beds and aircon because today, all my children turn nine. And, being my children, they love buffets. And they’ve always loved nothing more than splashing about in water. And, well, the comfy beds and aircon are just a bonus. As they slept last night, we did our best to transform the room into somewhere exciting. We hung up the “happy birthday” banners and bunting we bought in Bangkok on the walls, and blew up the balloons we bought in Cambodia. Janet had already snuck back to the room earlier to wrap up the presents we’ve been squirrelling away whenever we saw something suitably portable, and I had added several new books to their kindles (virtual presents being the most portable of all). At breakfast, Evie came back from the buffet with a plate piled high with cake and chips which I thought summed up today rather well. These few days are a break from budgeting and eating cheap local food. 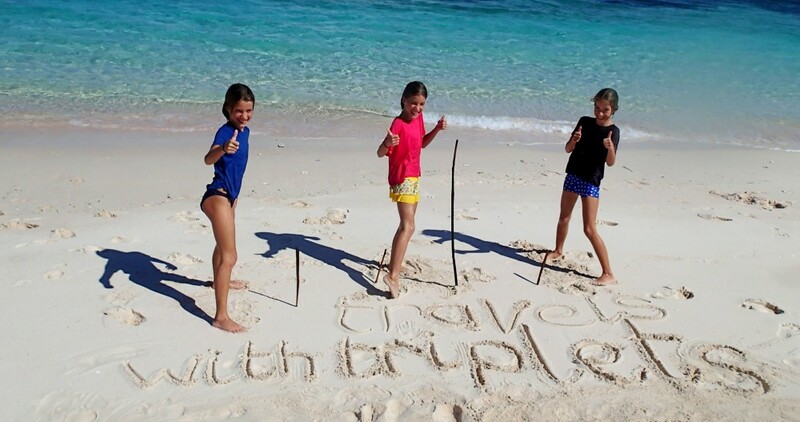 We bought the girls boomerangs so we’ll head down to the beach to try them out later, too. And little plaster of Paris moulding sets that well have to make very carefully in our posh hotel room. Between that and the pool and gorging ourselves, I think the rest of the day should contain lots of nine-year-old fun. Plus we managed to pick up three Swiss rolls and some “9” candles so we can sing “Happy Birthday”. We’ve been anxious that being abroad for their birthday would make our girls homesick but now that it’s here, and they seems happy and excited, I’m starting to feel excited, too. When Scarlett opened her eyes and saw the sparkly banner over her bed, she squealed, “How did you do that? !” And her sisters popped up from their own beds, wide eyed at the decorations and balloons everywhere and, all piling into our big bed for happy birthdays, I think we’ve made it ok for them. Since turning eight, my girls have only spent one month in the UK. Eleven countries and all kind of adventures and accidents later, their birthday feels like a milestone. Once today is over, we only have 14 days of travelling. Turning nine marks the beginning of a year where we’ll be going home, returning to jobs, school, home ownership and all the normal routines, rewards and responsibilities of a sedentary life. But today, that can all wait. Today we splash around in the pool, play on the beach, eat ourselves silly at the hotel buffet and play with presents. Worrying about coming home and coming to terms with the idea that my babies can possibly be nine years old and on the cusp of teenagerdom can wait for another day. When swimming in the ocean, remember to take the wallet containing nearly a hundred pounds in cash and your only bank card out of your swimming shorts’ pocket. Unlike me. We’ve been in Sri Lanka for 6 days now, and I feel like we are only just beginning to find our feet here. Coming from the cacophony of Bangkok, it’s a bit of a surprise to be back onto what we affectionately call ‘Nepali speed’. During our 3 months in Nepal, we at first resigned ourselves to everything taking approximately 25 times as long as it would in the UK, before slowly growing to love it. However, we’ve actually spent the last couple of months in various cities including Ho Chi Minh City, Phenom Phen and Bangkok, all of which are fairly frenetic. Life moves fast in the city (and so does the traffic), and we’ve grown used to having well stocked shops, an overwhelming choice of restaurants and a busy plan for each day. It’s going to be different here. The pace has slowed right down, and we’ve had to as well. Life is simpler, quieter and more natural here. People speak more slowly, they move more slowly. The only fast moving thing is the Leyland branded buses, which make me think of my Dad every time one comes hurtling down the road, which is at least 20 times a day. Sri Lanka is, in places, much less developed than Thailand or Vietnam today, and there are still huge stretches of un-spoilt coastline and unexplored trekking opportunities in the hills. For us, this country is going to be all about the wildlife. We’re planning whale watching, turtle spotting & a wild elephant safari, as well as seeing the tea plantations, and doing a little trekking in the hills, before we head off on our final long haul flight of the trip: Sri Lanka to Oman, Oman to London Heathrow, and home. It’s almost hard to summon the energy to really get the most out of this final leg of the trip. We are all feeling a little road weary, and looking forward to sleeping in our own beds again. However, with the infinite possibilities for exploration that Sri Lanka offers, I’m sure we’ll find that our last 21 sleeps will fly by. What Does a Lessin Look Like? Sounds Small and Slimy.